The Department of Labors plan to revamp the definition of fiduciary under ERISA is likely to face yet another legislative hurdle. The Department of Labor’s plan to revamp the definition of fiduciary under the Employee Retirement Income Security Act is likely to face yet another legislative hurdle. Industry trade groups are working on a bill that would “legislate a best-interest standard,” Steve Saxon, chairman of Groom Law Group, told reporters Monday after his comments at the Insured Retirement Institute’s Government Legal & Regulatory Conference in Washington. SIFMA’s “uniform best-interests-of-the-customer legal standard for broker-dealers” would apply to all retail brokerage accounts, and seeks to correct the potentially conflicting fiduciary rules to be issued by DOL and the Securities and Exchange Commission. Indeed, former SEC Commissioner Troy Paredes noted at the IRI event that he’d like to see the SEC become the agency that “has the lead” on a fiduciary rulemaking. Lawmakers, too, will press ahead during the upcoming October appropriations process to defund DOL’s plan, Saxon said. Both the House and Senate appropriations committees have recently passed bills to prohibit DOL from using any of its funds to finalize, implement or enforce its fiduciary rulemaking. Rep. Ann Wagner’s bill, H.R. 2374, the Retail Investor Protection Act, which would require the DOL to wait to repropose its rule until the Securities and Exchange Commission issues its own fiduciary rulemaking, “will continue to be supported,” said Saxon, who has been critical of DOL’s redraft. Of course, these bills face a “huge hurdle” in overcoming a presidential veto, Saxon conceded. “The White House is in support of the general direction that the DOL is going” with its fiduciary redraft. But Saxon didn’t hold back on airing his criticisms of DOL’s fiduciary plan at the IRI event, calling the redraft an “Erisafication” of IRAs. 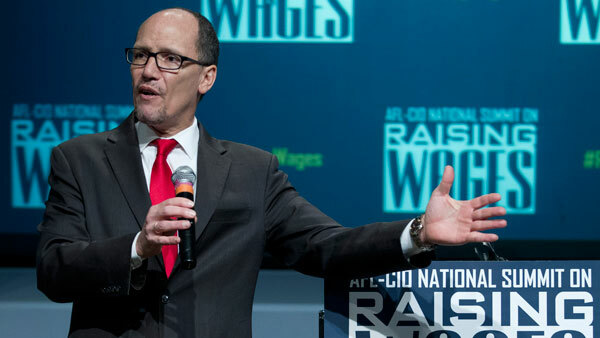 “Labor does not have jurisdiction of IRAs under Title 1 of ERISA,” he said. But as drafted, the disclosure requirements under the BICE are “not workable,” Saxon said. Perez stated at the Brookings event that the comments DOL is receiving on the redraft are helping to “sharpen” its thinking on how to make changes to the plan’s prohibited transaction exemptions, like the point of sale disclosure requirements under BICE. The comment period ends July 21, and then DOL will hold hearings on the redraft the week of Aug. 10. Saxon said that while he appreciates DOL taking industry feedback, DOL should give the industry some idea “where its redraft is headed” before the August hearings.